Media & Entertainment « Global Market Insights, Inc. The last decade has witnessed a dramatic acceptance of distributed ledger technology for data security, a shift that has led to blockchain market emerging as one of the most trending business spheres. The potential scope of blockchain technology for money saving, record-keeping, and digital information sharing has been remarkably attracting most of the technology giants to deploy the blockchain at their workplaces. Core companies across the banking, telecommunication, smartphone, and healthcare service sectors have also been looking forward to extensively adopting blockchain technology, thereby augmenting blockchain industry share over the years ahead. The emergence of blockchain in this modern technological era has indeed had a remarkable influence on the operational processes of several end-use sectors. The need for this technology has gained acceptance across several domains on account of its benefits over other existing technologies. A gist of how the implementation of the blockchain has impacted the BFSI sector has been enumerated in the paragraphs below. The surging adoption of blockchain technology by various companies for ensuring an easy workflow and data security is poised to push blockchain market share. Moreover, the noteworthy benefits of this newly developed distributed ledger technology are significantly attracting large companies as well as SMBs to develop private blockchain platforms. 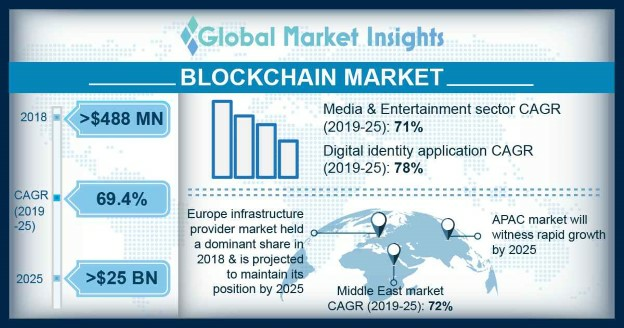 Driven by the increasing need for financial capitalization, data protection, and network enhancement, blockchain market will generate a revenue of more than USD 16 billion by the end of 2024. This entry was posted in Sustainable & Smart Technologies and tagged Application Provider, BFSI, Blockchain Market, Blockchain Market Analysis, Blockchain Market Forecast, Blockchain Market Growth, Blockchain Market Report, Blockchain Market Research, Blockchain Market Share, Blockchain Market Size, Blockchain Market Value, Blockchain Technology Market, Compliance & Risk Management, Digital Identity, Exchange, Government, Healthcare, Infrastructure Provider, IT Service, Media & Entertainment, Operators, Payment & Wallet, Smart Contract, Transportation & Logistics. Samsung’s 2016 acquisition of Harman is one of the most apt recent instances depicting the massive developments in embedded software market. This is a precise example of the ‘connected’ path where an electronics giant joint hands with a renowned automotive player, both significantly connected to the Internet of things. The dynamic world today, driven by ‘smart’ technologies, demand precise and real time operations in every aspect, without any delays. The demand for real time operating systems across various industries such as automotive, consumer electronics, healthcare, military & defense, telecommunication, etc., is creating a huge scope for embedded software market. It is estimated that by the end of 2022, nearly all the cars will be connected to the cloud. This will lead to automotive sector contributing towards a significant share of the embedded software market. The RTOS enables the car with features like internet based services, navigation, data communication systems such as keyless entry, infotainment, etc. Moreover, it also looks after the security aspects of the vehicle by monitoring airbags, tire inflation, and ABS (antilock braking systems). In addition to this, the rising trend of electric and hybrid electric vehicles will also boost the embedded software market size in the automotive sector. 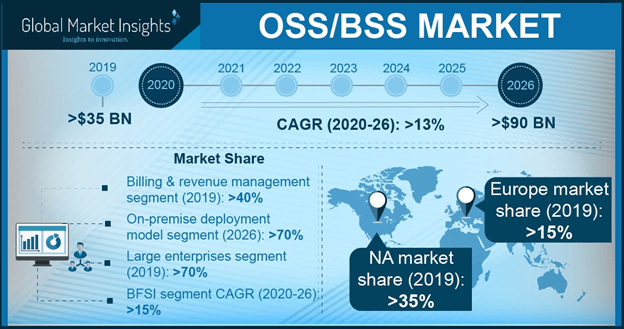 Powered by the robust surge in the demand for autonomous cars that enables vendors to incorporate embedded systems into automobile ECUs, the overall embedded software market share from automotive applications is projected to register a CAGR of more than 11% over 2018-2024. 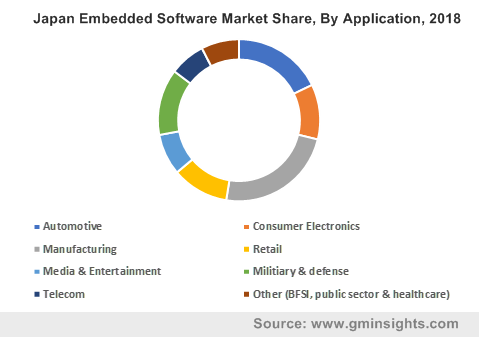 The global market for embedded software is quite promising. North America accounted for over 51% of the overall embedded software industry share in 2017, and is likely to continue its lucrative growth trajectory over the coming years. A large industry base across this region makes it a lucrative ground for embedded software market. Additionally, the region has been privy to a rise in the number of startups designed to offer highly innovative software solutions in the U.S. that will help the continent establish an authoritative position across the global business space. North America embedded software market will also experience a commendable growth on account of the surge in the adoption of RTOS-incorporated hardware such as Windows CE, VxWorks, Fusion RTOS, and Lynx OS. The growing IoT industry which itself has limitless potentials, will bring immense growth opportunities for the embedded software market players. The software will reduce the complexities which the developers face while designing the various IoT products. The industry will witness various mergers & acquisitions and strategic collaborations to improve their product range and quality. For instance, a recent collaboration was the acquisition of Micrium RTOS by Silicon Labs to bet on the IoT landscape. Some of the key market players holding a significant share in this business space are Altera, IBM, Infineon, Johnson Matthey, LG CNS, Intel, Xilinx, Mentor Graphics, Express Logic, Advantech, ENEA, Green Hills Software, and Microsoft. 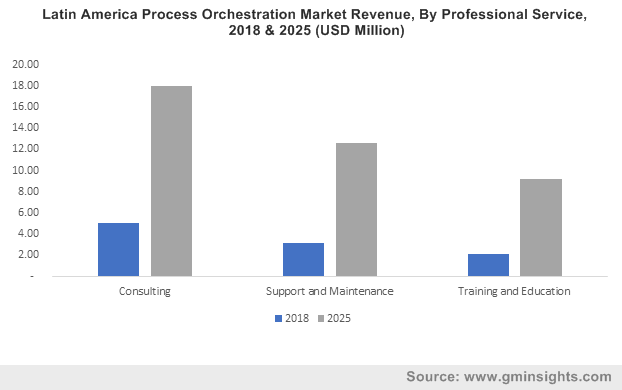 The envision of a smart connected world will be well accompanied by the embedded software market growth over the coming timeframe. This entry was posted in Sustainable & Smart Technologies and tagged Automotive, Consumer Electronics, Embedded Software Market, Embedded Software Market Growth, Embedded Software Market Share, Embedded Software Market Size, Embedded Software Market Trends, General Purpose Operating System, GPOS, IT&Telecom, Manufacturing, Media & Entertainment, Military & Defense, Mobile System, Network System, Operating System, Real Time Operating System, Real Time System, Retail, RTOS, Standalone System.